Today I got to the freedom trail at 2:00 pm so I jogged all the way to the springs in 11 minuets. I would have got there faster but some teen aged girls with a guitar slowed me down near the bottom of Mofo hill. When I got there there were some old friends at the Arizona pool so i got into there. 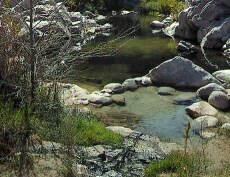 The Arizona pool is 11 inches below where the dam height is . Still a good soak.The creek is about the same height, still. The creek water is still in the 30 degree range. The pools were all very nice and everyone were grooving on the mellow music. As I drove by that dam trash I noticed that some body hauled away @ 1 truck load of trash. So, thanks to whoever! No cows spotted to day as the sunshine was awesome.